Elizabeth Ann Fox was born to a family of mixed ethnicities and religions. Her father Edward Whiting Fox, a Cornell professor who specialized in the history of modern Europe, was Protestant and of English and Scotch-Irish descent. Her mother Elizabeth Mary Simon Fox, was Jewish from a German-Jewish immigrant family. Elizabeth received a B.A. in French and history in 1963 from Bryn Mawr and studied at the Institut d'Etudes Politiques de Paris. She earned an M.A. and then a Ph.D. in history at Harvard. She taught at the State University of New York at Binghamton and the University of Rochester. In 1969, she married fellow historian Eugene D. Genovese, with whom she founded the journal Marxist Perspectives and sometimes co-wrote works. 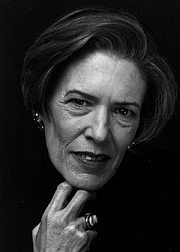 In 1986, Elizabeth Fox-Genovese began teaching history at Emory University, where she was named the Eleonore Raoul Professor of the Humanities. She founded the Institute for Women's Studies, which she served as director until 1991, and started the first doctoral program in women's studies in the USA. Her original academic interest had been French history, but she changed to the history of women in the pre-Civil War Southern USA. Among her works were on the subject were Within the Plantation Household: Black and White Women of the Old South (1988) and To Be Worthy of God’s Favor: Southern Women’s Defense and Critique of Slavery (1993). Elizabeth Fox-Genovese also wrote scholarly and popular works on feminism. In 1995, she converted to the Roman Catholicism faith. After her death in 2007, her husband published a tribute to his wife, Miss Betsey: A Memoir of Marriage. Elizabeth Fox-Genovese is currently considered a "single author." If one or more works are by a distinct, homonymous authors, go ahead and split the author. Elizabeth Fox-Genovese is composed of 4 names. You can examine and separate out names.